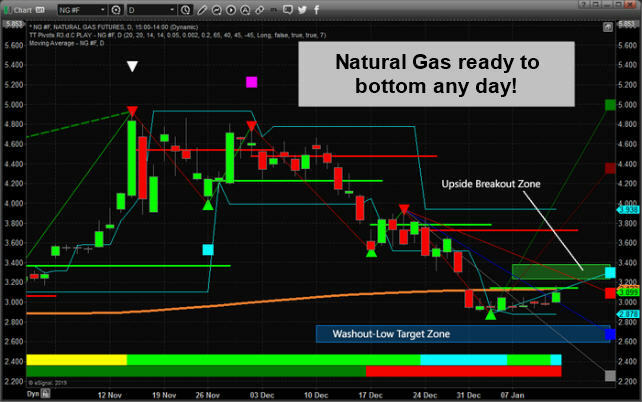 Will Natural Gas Breakout Or Breakdown Next? 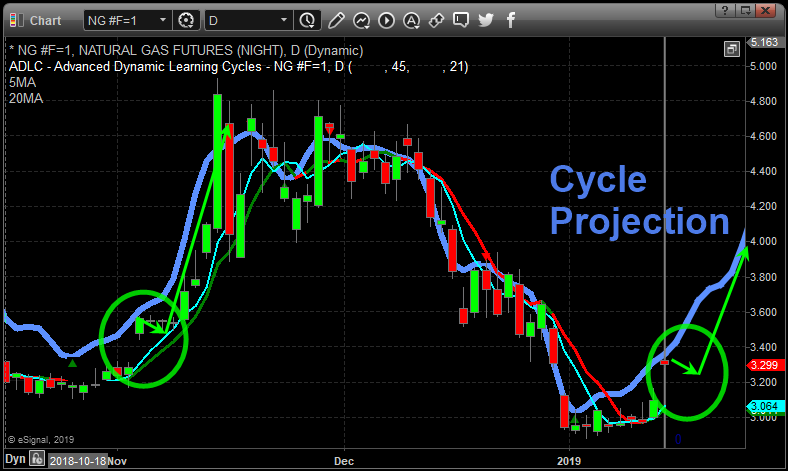 We called the move from $4.75 to $2.90 in Natural Gas, and our predictive modeling solutions are suggesting a new upside rally in price is setting up for early Spring. Very cold weather across the Northwest and Eastern US, as well as moderate demand globally, should prompt a renewed rally in Natural Gas through at least March or April of 2019. A move to, or above, $3.30~$3.40 would indicate there is little chance of a Washout-Low price formation and that a new rally is in place. Over the past week, we have been remained bearish on natural gas but Friday’s strong close and Sunday nights price of natural gas futures showing a 7% pop signals a potential trend change happening. In short, natural gas was oversold, its been testing the $3.00 whole number which acted as support for the price. Also, our cycle analysis does point to higher prices from here. The trend had not fully reversed, but it appears to be doing that as of this writing. We believe Natural Gas provides an excellent opportunity for a move back to near $4.20~$4.40 as the extended cold weather and global demand continue to put renewed pricing pressure on this commodity. We believe the next upside move could be very fast regarding upside price recovery. While natural gas is can provide some explosive moves for short term gains, if you are a short term trader looking for pre-market trade setups, and morning gap trades similar to the 8 winning trade setups we had last week be sure to check out our last post on Price Spike Trades, and Gap Windows! Visit www.TheTechnicalTrader.com to learn how we can help you find and execute better trades in 2019.